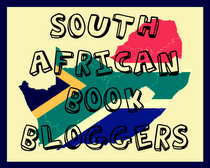 It’s been a while since I last posted a review. 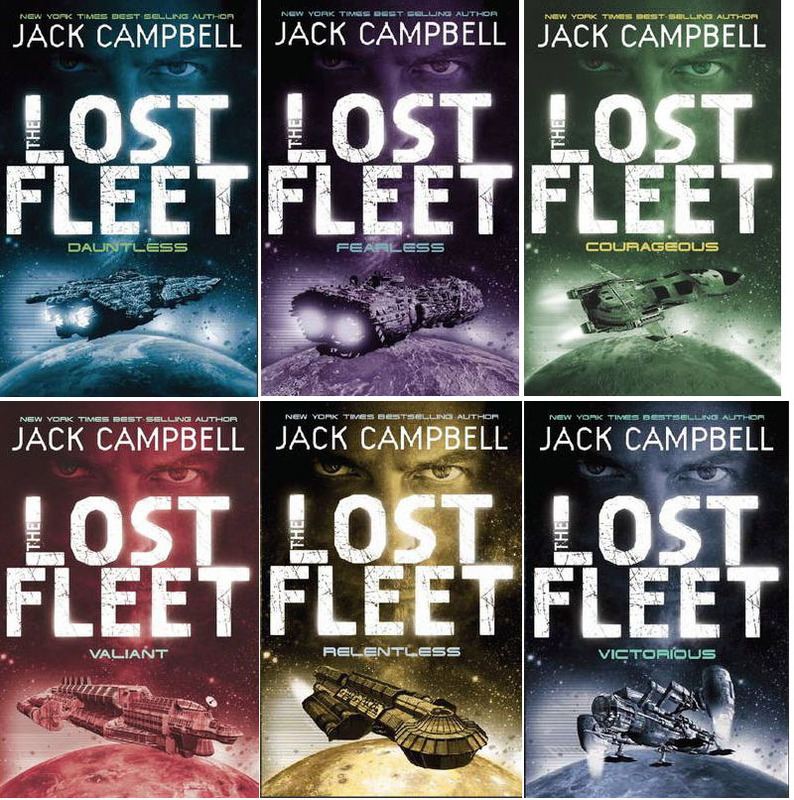 The reason for that is that I’ve been busy reading the entire Lost Fleet series by Jack Campbell (pseudonym used by John G Hemry) in-between working on various other projects. The entire series could very well have been a single (huge) novel, since each one contains a small chunk of the overall story. Since that’s the case I’m going to review the series in its entirety and not focus on each book individually (keeping things spoiler-free as well). Imagine Battlestar Galactica with a twist of Buck Rogers thrown in and you’ve basically got the idea behind the Lost fleet series. Humanity has split into two factions, the Alliance and the Syndics, which have been at war for the last hundred years. Both sides have paid a heavy price in both personnel and resources and the war has deadlocked into a war of attrition with neither side gaining the upper hand. The series kicks off with a bang. Captain Jack Geary is rescued from an escape pod while the Alliance Fleet is on its way to strike at the Syndic home world. The only problem is that he has been in survival sleep since the start of the war a hundred years previously. He finds himself venerated as “Black Jack” a godlike figure in Alliance history based on a distorted view of his heroic actions at the start of the war. When the Alliance Fleet gets to the Syndic home world they find themselves surrounded and outnumbered. The leaders of the Alliance Fleet are drawn into negotiations where they are executed leaving Jack Geary the highest ranking officer. He has to command the fleet and somehow find a way to get them home to Alliance space again. The novels follow the journey of the Alliance fleet as they struggle to survive and battle their way back home. Geary has to contend with inexperienced personnel, internal strife and sabotage while trying to restore tactics and honor to the fleet. The characters are engaging and there is a definite growth in their development during the series. I loved the banter and interactions between Geary, Desjani and Rione and how their relationships changed and matured. Where the series truly shines is in the depiction of space warfare. It deals splendidly with the immensity of space, taking relativistic distortion and time delays into account. The tactics used are both believable and nail biting to see in action. I blew through the pages with battle scenes just to find out how they turn out. Overall I really enjoyed the series. Some of the novels where pretty average, but the rest more than made up for it. There’s an unexpected twist that adds a new dimension to the story and sets the scene for a follow-up series. The only criticism I have is that the repetition of the back story and tedious explanation of the conference room (you’ll definitely spot it!) in every novel got on my nerves. I can see how someone new to the series would find it useful, but after the second time it just irritated me. If you like military science fiction you’ll definitely like this. 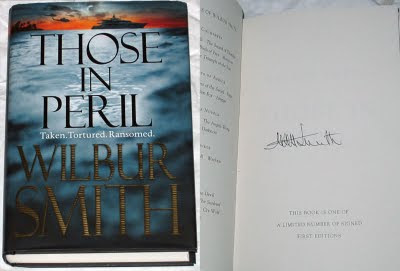 It seems I've been quite lucky this year when it comes to competitions, at least those with books as prizes! 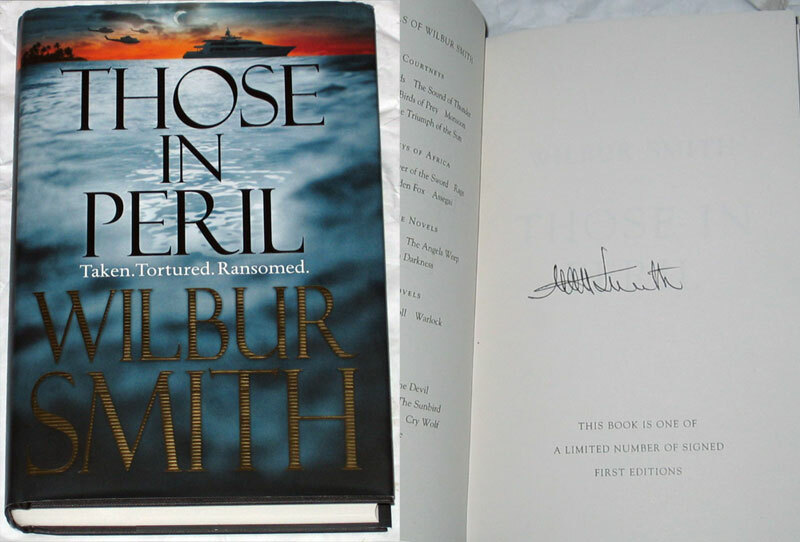 The latest addition to my collection is a signed first edition copy of Wilbur Smith's latest novel, Those in Peril, which arrived today. Thanks Pan Macmillan!